This text celebrates the fourth Tsukuba International Conference on Memory (Tic4) held in January of 2003, by setting forth productive directions for memory researchers and human learning theorists around the world. It presents fascinating perspectives on progress, and future prospects for models, theories, and hypotheses authors developed, including several new, never published experimental results. Contributors include the winner of the 1997 U.S. Congressional Medal of Science--William K. Estes--who graced the text by penning the forward. The three full day presentations of Tic4 included presentations by 225 experts, represented by 73 universities from countries on four continents: Europe, Asia, Australia, and North America. 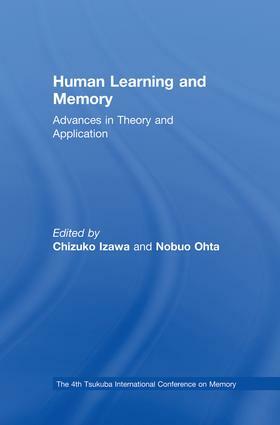 Human Learning and Memory presents 11 chapters by invited speakers, and its appendices include titles of all papers accepted for Tic4 presentations, as well as a background introduction to Japanese cultures, relevant to Tic4 experiences. This book appeals to scholars, researchers, and teachers in the fields of human learning and memory, cognition, language learning, and educational psychology (theoretical, empirical, and applied dimensions). It can also be used as a textbook for both advanced undergraduate and graduate courses in these domains, either as required or recommended reading.